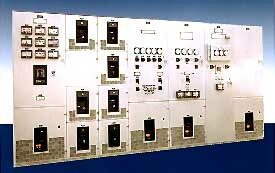 Power Control Systems - Russelectric Inc.
Power control and switchgear systems in low and medium voltage ratings for single- and multi-unit on-site power generators. In addition to emergency power, system designs may include control functions such as peak shaving, load curtailment and utility paralleling for both open transition transfer and live-source closed transition transfer that allows retransfer and system test without disturbing the load. Prime power/cogeneration systems are also available. Systems include PLC controls for automatic prime mover starting and stopping, prime mover status and alarm annunciation, synchronizing, and priority load control. Other features such as load demand control for fuel management are available. Systems include sensors to monitor volts, amps, watts, frequency, and other pertinent electrical power data of both individual generator sets and the overall system. Controls can be furnished for any type of prime mover including diesel engines, according to the company, as well as gas, steam or hydro turbines. Custom systems integrating SCADA and simulation are available as options. All systems are UL listed and designed and built in accordance with ANSI, IEEE and NEMA standards.